Buffett's massive bet on Apple stock is paying off handsomely. 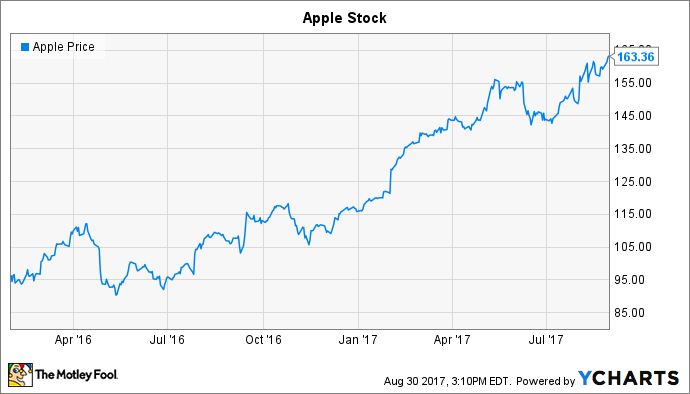 Since famed investor Warren Buffett's Berkshire Hathaway (NYSE:BRK-B) (NYSE:BRK-A) started investing in Apple (NASDAQ:AAPL) in early 2016, the technology company's stock has soared. Apple stock is up nearly 70% since the middle of the first quarter of 2016. But despite the stock's sharp rise, and even though Berkshire has already made billions on the massive bet, selling shares of the tech giant is the last thing on Buffett's mind right now. Here's a close look at the billions of dollars Buffett has already made on Apple, and what the Berkshire CEO and chairman thinks of the stock today. Berkshire's initial stake in Apple, built in the first quarter of 2016, totaled 9.8 million shares. On this stake alone, Buffett likely made around a half of a billion dollars. But Berkshire was barely getting started. By Q2, Berkshire had bought an additional 5.42 million shares, paying between $90 and $112. And by the end of 2016, Berkshire's stake in Apple had swelled to about 61.2 million shares, purchased at prices between $106 and $118. Then came Berkshire's biggest quarter of Apple-stock buying yet: Berkshire doubled its stake in Apple in the first quarter of 2017, paying between $116 and $122 per share. Today Berkshire owns about 130 million Apple shares, giving it a 2.5% stake in the device maker. With shares trading at about $163 at the time of this writing, Berkshire has made some serious money on its Apple stock. In total, Berkshire has likely already accumulated a net gain on Apple stock worth around $7 billion, bringing the total value of Berkshire's Apple stock to more than $21 billion. Apple stock is now Berkshire's fourth-largest equity holding. On Wednesday morning, Buffett provided an update on Berkshire's Apple stake during an interview with CNBC. Even after making around $7 billion on the stock already, Buffett seems confident in the holding. Noting that one of his two investing lieutenants at Berkshire had recently sold a portion of the conglomerate's Apple stake (the first 9.8 million Apple shares Berkshire bought was a purchase of one of Buffett's lieutenants), Buffett said, "I've never sold a share." And it's possible that Buffett has been buying even more Apple stock recently, as he deflected a question about whether he has continued to buy Apple stock: "Well I don't think I'll tell you that much, but I certainly was buying last quarter and I don't pay attention to the calendar when I'm buying." Buffett also took the opportunity during the interview to share his optimistic outlook for Apple when pressed about how he feels about IBM: "I still don't know that much about [IBM's] future, but I feel more certain about the future as I look at a company like Apple than when I look at IBM now." Overall, it's clear that Buffett remains happy with his massive bet on Apple stock. Buffett's bullish comments about Apple come just as the tech giant's stock is hitting a new all-time high, and just ahead of Apple's expected iPhone 8 launch next month.